I'm back! Is this a joke? Nope, I AM BACK! I took a semi 2 year hiatus, (nearly 3), after the birth of my last son in 2016 and for much of my pregnancy the year before. I found myself, overwhelmed, and all too consumed with being a mommy to a new baby all over again, to focus on much else. In those years, I had fawned over, projects I'd like to complete one day, as he was older. I craved to put a paint brush in my hands again. I desperately NEEDED my creativity to come out, since it had been such a long time, since I had been able to start and finish a DIY project. 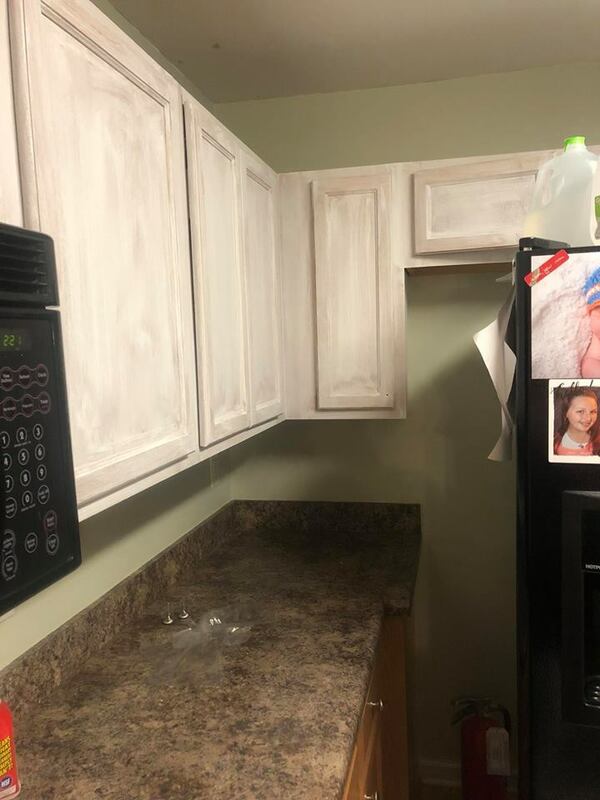 I stalked the internet (mostly instagram hashtags) over the years, for the easiest ways to paint my kitchen cabinets. I was settled on the fact that I would have to painstakingly sand and primer and remove EVERYTHING. I didn't like this idea one bit. 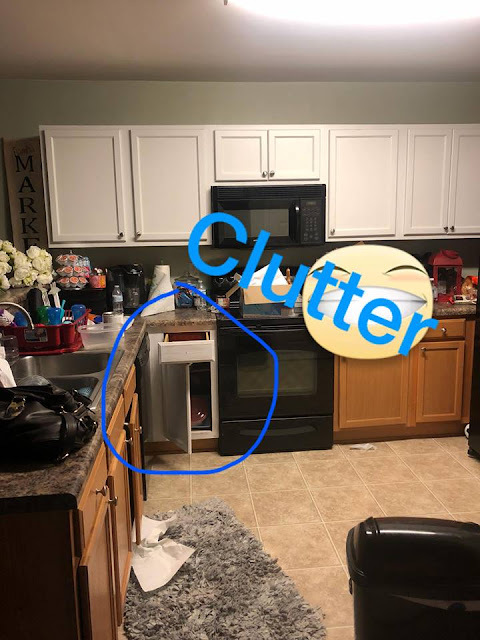 One, it would take way too much time out of my mentally worn out days, and two, I didn't desire to chase a busy body toddler around during all of the chaos it would take. Like everyone else looking for short cuts, I looked into chalk paint. There wasn't any ONE particular source I gathered all of my information from, but multiple. In the end I decided, I would use the cheaper of brand in the chalk paint world and seal it with a polyacrylic finish. Below: What my little heart desired to use for this project. So far, I've only managed to complete the TOP row, and one bottom set. So, let me fill you in. 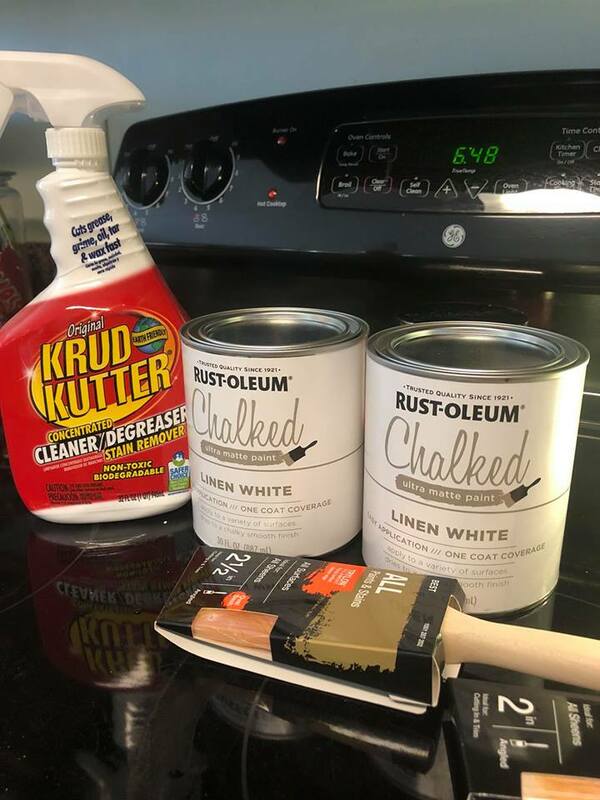 First, I ended up using 2 paint brushes that I felt were good for ME, and MY hands, and I did the first coat, BUT ONLY after I used KRUD KUTTER to degrease, and then a bucket of hot water and diluted dawn dishsoap to have a super clean surface. 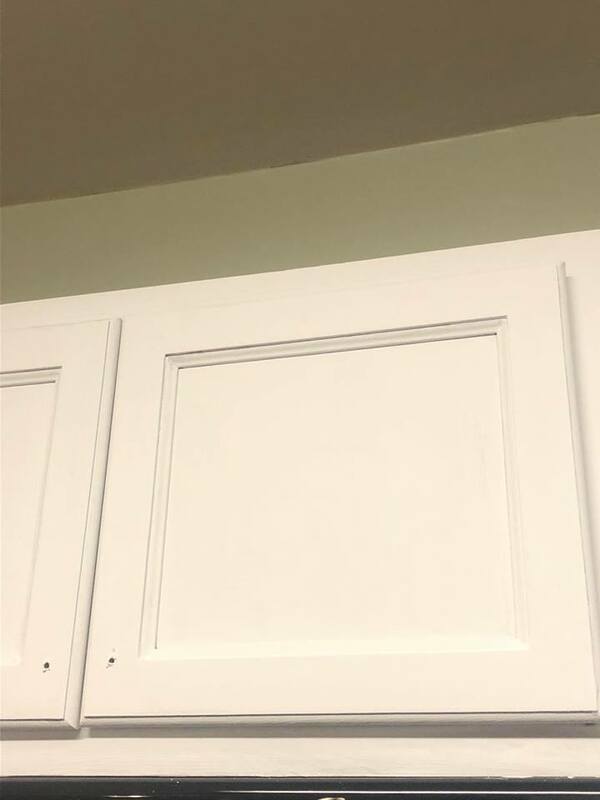 My cabinets started off as builder grade shiny oak. YUCK. Nothing I myself have ever loved. 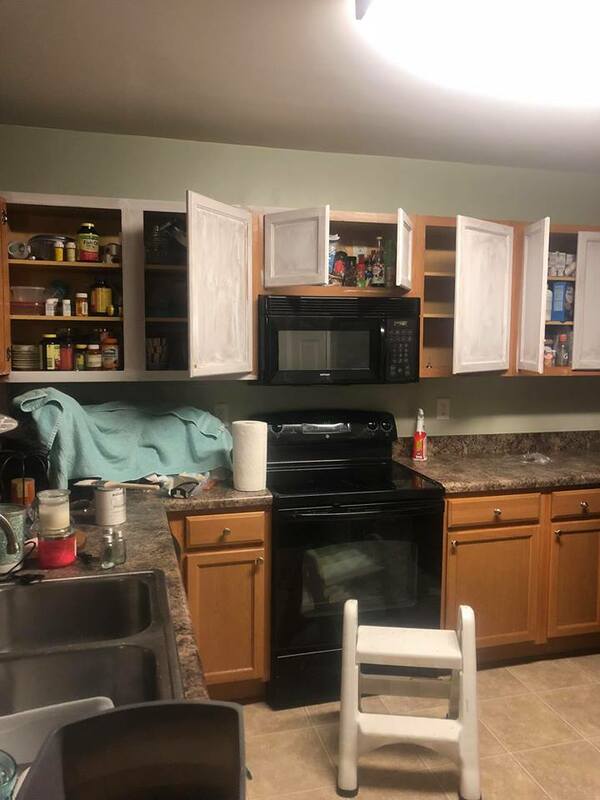 I made the decision one night at 2 am, that I would do the paint in place, and only remove the knobs on the cabinets. There was no way on God's green earth I would have time to remove everything. So that that I painted my first streaky, hideous coat of Rustoleum's chalk paint. The next morning I did my second coat, and mid afternoon my third coat. I waited a day, and then did the fourth coat. After a few hours of dry time, I did my first coat of matte polyacrylic with a brush, making sure to not have any drips. I let it dry 5 hours, and did my second coat with a foam craft brush. In all I put on 4 thin coats of the polyacrylic to seal everything. 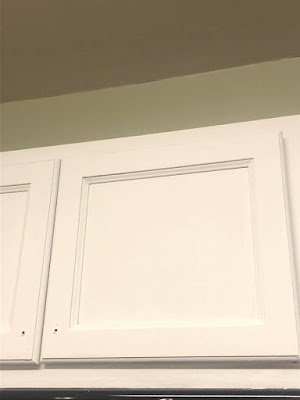 I let the cabinets cure for a couple of days, and added the knobs back. I did the scratch test with my finger nail, and no paint came off. SUCCESS!! It's been 3 weeks now, and so far so good. I just need to find time to do the lower ones. 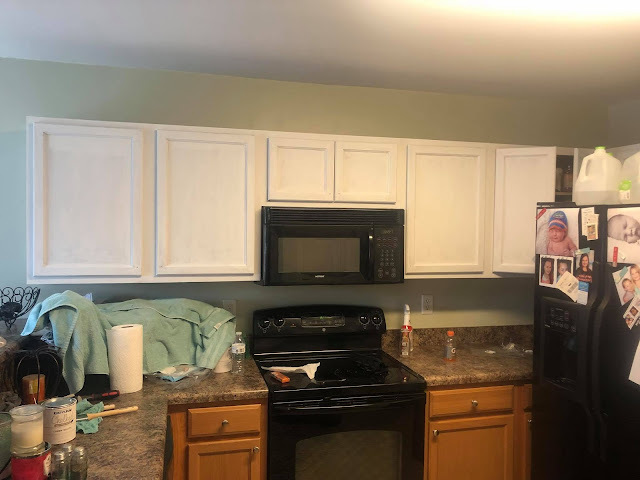 I just figured I would make this quick update, for anyone looking for the absolute EASIEST way to repaint your cabinets:) Much luck, dear readers! I can't wait to finish, and start more projects and show them with you all. It's been so long. Hello, friends! Recently, I was contacted and asked if I would like to do a blog review for museumtrees.com . Have you ever stepped foot inside a mall, hospital, aquarium, or museum, and noticed the beautiful artificial landscape and trees? I have. One of my favorite aquariums in Kure Beach, has an endless amount of faux foliage. The beauty seems all to real, until you reach out and touch it. I know, I am not the only one, who asks, "is this plant real?" while reaching to further inspect. And, here you have this great company, at museumtrees.com that does just that. 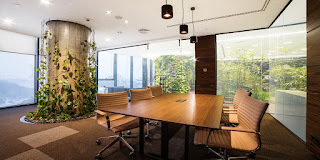 Whether you have a large or small commercial project that needs a touch of the outdoors, brought indoors, or out, museumtrees.com is the place for you. Typically, Museum Trees, will consult with the architect or designer at the introductory phase to the design process to enable the necessary structural supports or footings so that the tree sculpture can be included into the engineering right away. All of the products are crafted from only the highest quality material in order to look and feel both realistic, and durable. Any type of tree, you can think of, Museum Trees, more than likely has it. Museum Trees, has been in the industry for over 40 years, giving clients across the globe an incredible experience with the beauty and design process, that only they know how to complete. Let's be honest, taking care of live plants, can be an arduous task if you aren't exactly a green thumb. It can require more hours for employees to take care of a live landscape, and sometimes the landscape doesn't always meet your expectations. Why not hire Museum Trees, and cut back and save money on the man hours that it requires to upkeep a live landscape, and go for something that looks just as good? What a great investment! With Museum Trees, the artificial landscape takes the hard work out of growing and nurturing live plants. 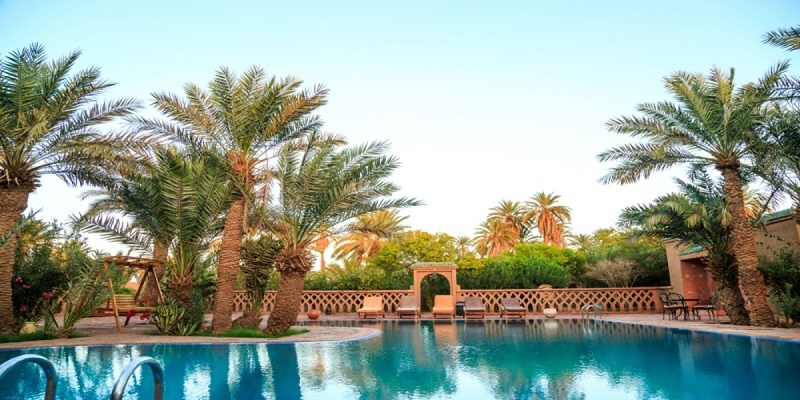 They do the hard work for you, and you in turn, (as well as your clients, and/or guests) are able to sit back and enjoy the lifelike beauty for years to come. 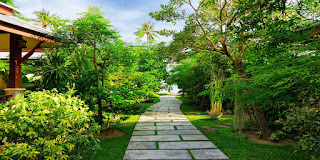 Adding artificial landscape to any design element makes a place more inviting and more appealing to your clients. Head on over to Museum Trees today, to view all of the wonderful aspects of artificial landscape, they have to offer the commercial business industry. Recently, I had the pleasure, of being contacted by Commercial Silk with an offer to do a blog review. I chose a hydrangea wreath and fell in love with the quality. Most people in today's fast paced world don't have time (or the green thumb) to properly care for plants. That's where Commercial Silk comes in. Do you have an office? A business? A health care facility-- be it a dental, nursing, or urgent care establishment? Perhaps a real estate office? Do you ever notice, that the business' that draw you in the most, are those that some how incorporate the outdoors? I know when I come into a business that has real or artificial plants, I feel more at ease, more apt to want to hand my hard earned money over to a place that makes me feel welcomed. Nothing welcomes me as much as seeing plants in a business, along with great customer/client service. I strongly feel that Commercial Silk has the ability to provide these ammenities to their clients. 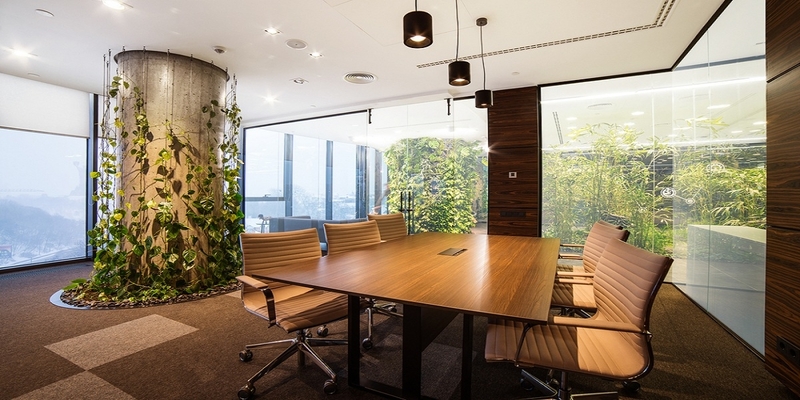 Founded in 1986, Commercial Silk has had a broad experience in interior landscaping design. They can offer a single product, or a complete design and build set up for your facility. Currently, they are rapidly expanding across the globe and have a reputation for outstanding design and services. Taking the title of Best Project Award in 2009 by Interiorscape's 24th Annual Competition, which featured their interior landscape renovation, they are no strangers to the design world. They were also featured in Texas Home & Living Magazine. Head on over to their website, and let the images and their high quality work speak for itself. Why not spruce up and make your business more inviting today? Give the kind folks over at Commercial Silk a call and let them help assist you in the next step towards attracting more clients.